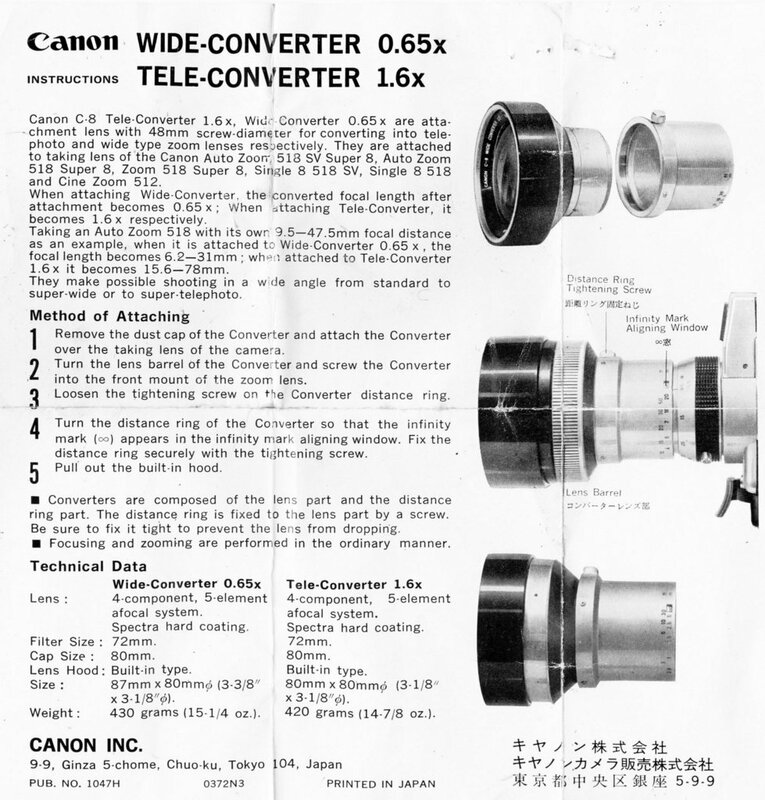 Canon C-8 Tele-Converter 1.6x, Wide-Converter 0.65x are attachment lens with 48mm screw-diameter for converting into telephoto and wide type zoom lenses respectively. They are attached to taking lens of the Canon Auto Zoom 518 SV Super 8, Auto Zoom 518 Super 8, Zoom 518 Super 8, Single 8 518 SV, Single 8 518 and Cine Zoom 512. When attaching Wide-Converter, the converted focal length after attachment becomes 0.65 x When attaching Tele-Converter, it becomes 1.6 x respectively. Taking an Auto Zoom 518 with its own 9.S - 47.5mm focal distance as an example, when it is attached to Wide-Converter 0.65 x ,the focal length becomes 6.2 to 31mm when attached to Tele-Converter 1.6x it becomes 15.6 to 78mm. They make possible shooting in a wide angle from standard to super-wide or to super-telephoto.